No gorings and just one injured runner taken to hospital in the cleanest running of the bulls this year. Without living up to their name as a dangerous bull-breed, the Jandilla bulls from Cadiz featured in a very fast and exciting fifth running of the bulls. Nobody was injured by the horns of the bulls and only one person was taken to the Virgen del Camino hospital. The bulls covered the whole course in 2 min. 36 sec. in a run where they behaved very nobly without threatening to charge the large number of runners who crowded the whole length of the course today. The moments of greatest danger and nervousness occurred at the final stretch leading into the bullring when the bull bringing up the rear charged into a pile of runners on the right side of the fencing. The horns of this bull brushed against several of the runners, but nobody suffered even a jab from the horns. The pack of bulls came out of the pens in Santo Domingo tightly bunched together behind the bell-oxen and they charged at a fast pace up the first stretch and across City Hall square and Mercaderes. In these first three stretches of the run there were the usual trip-ups and falls and the fast pace of the bulls meant that the runners had no time to get in front of the horns of the bulls. One of the bulls slipped up as it crossed Mercaderes, but it quickly to its feet and rejoined the other bulls. The pack passed across the corner of Mercaderes without slipping up or crashing into the fencing. 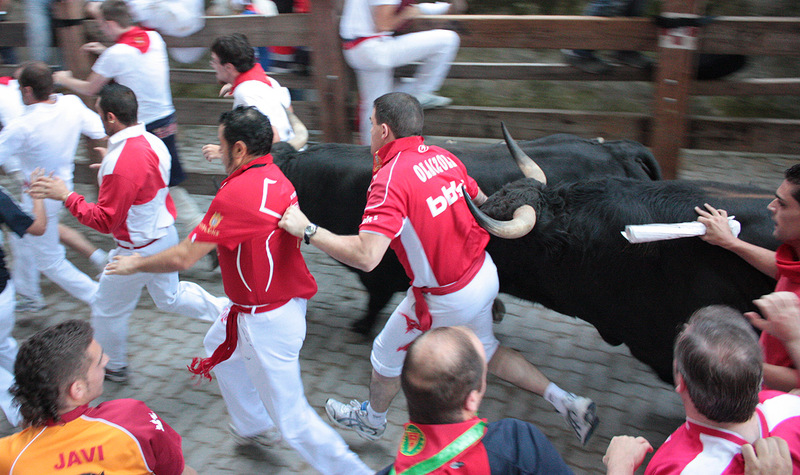 Once in Estafeta Street, the bulls began to stretch out a little more and the runners could find some space in front of the horns to produce some eye-catching close runs in front of the horns. At the beginning of the stretch one of the bulls slipped up, but it got up quickly and continued to run ahead without making any threats with its horns at all. The three leading bulls continued to be encircled by the bell-oxen and the other three bulls were bringing up the rear just a few meters behind, where one ran alone for a period while the other two bulls stayed close together. Near the end of the street there was a small pile-up of runners and the bull running alone crashed into the pile-up but got quickly to its feet to join the two rear bulls and race ahead with them without threatening with its horns. The few moments of panic occurred on the stretch leading down into the bullring where there were a lot of runners gathered on the right side of the fencing and the rear bull charged into them on this side. In spite of the contact and impact of the image where the bull’s horns were brushing against several of the runners as it charged ahead, it seems there were no gorings suffered by anyone. After this moment of fright, the bulls were all entering the arena at a very fast pace, and although some of them were a bit distracted in the ring, the “dobladores” with their capes were very quick to lead them towards the safety of the pens without receiving any resistance. 19 running bulls. 31 goring. 108 traumatisms.